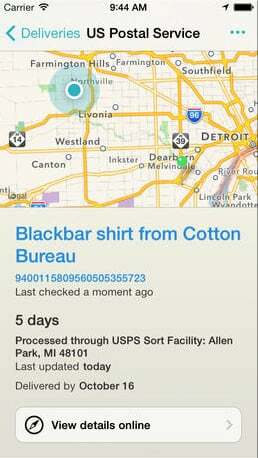 A full-featured package tracking app, Delivery Status touch has just been updated with the move to version 5.1. The top tweak in the updated version is improved background notifications. According to developer Junecloud, updates are more frequent when they’re needed, less frequent when they’re not. We’ve also gotten rid of some unnecessary notifications, and fixed some problems where notifications weren’t appearing when they should. Badges are now also shown for background notifications. If you dont like that feature, you can turn it off by heading to the Notification Center part of the Settings app. Heres the complete list of other changes. Delivered notifications now start with a checkmark to make them immediately clear. The menu now includes an option to Archiveor Delete for already archived items. You can now type a space in the search field to show everything. You can now swipe to delete an archived delivery while searching. Keyboard shortcuts for Bluetooth keyboards in iOS 7. N: add a new delivery. F: search. : close the current view or cancel search. The map does a much better job of zooming into the right area, especially on iOS 7.1 or if the package is across the Pacific from you. Apple orders can no longer be looked up by zip code, so the interface has been updated to reflect this. The barcode and 1Password buttons are much, much easier to tap now. AmazonSmile URLs are now detected on the clipboard. If the delivery date changes after a shipment is delivered, it will no longer trigger a notification. The Clear Passwords option now clears your cookies as well, completely logging you out of third-party services. Manually refreshing now only excludes deliveries that were updated in the last 5 minutes (rather than 10). Updating the calendar is a bit more efficient now. The update also offers a number of bug fixes, including an issue that caused various display quirks with iOS 7.1. A universal app designed for the iPhone/iPod touch and iPad/iPad mini, Delivery Status touch can be downloaded now on the App Store for $4.99. Before the most recent update, version 5.0.1 landed in November. That edition brought iCloud Keychain support and other features. Version 5.0, which featured a iOS 7 friendly design and a host of other tweaks, arrived on the App Store in early October. If youre interested in similar titles, take a look at our App List featuring Shipment Status Apps.